The direction of the trend of any financial market may be the most important piece of technical information we can use in our trading. Many of the most successful traders in the world will tell you that this is the only piece of technical information we can even begin to know. They will tell you that there is no way to know when a market will reverse or how long a move will last. All they know is that right now this is the direction of the trend and that the odds favor a continued move in that same direction rather than a change. Think about that for a moment. Some of the most successful traders in the world will tell you that the only piece of technical information you can possibly know is the direction of the trend up until the moment you enter into a trade. There is no way to know if the trend will change soon, the level of the next reversal or how long a move will last. They will tell you that any attempt to predict the future is an exercise in futility and a waste of time. Then how do they make money trading? The best traders react to what is happening now instead of trying to predict the future. The important first step is to find the strong trending markets since that may increase the chance of a continued move in that same direction. Let’s take a look at some examples of strong trending moves. 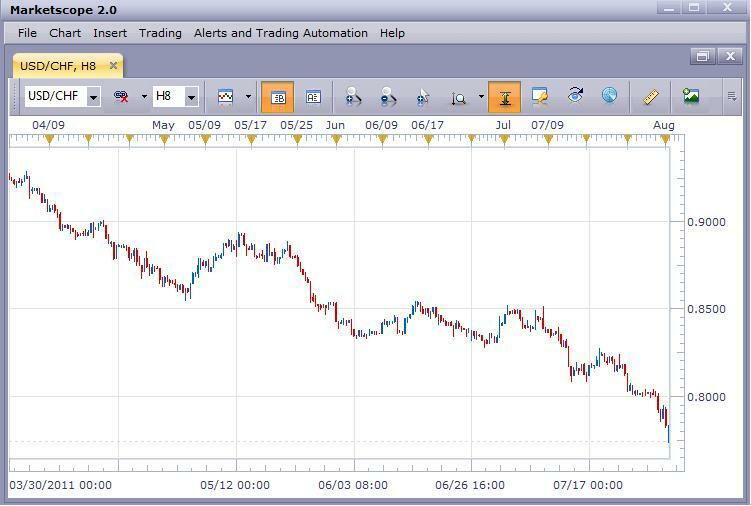 This is an 8-hour chart of the USD/CHF. This market is trending down strongly which means that the USD is weaker than the CHF. When using an 8-hour chart, plotting about 80 days of trading offers a good view to judge the trend. This is a 4-hour chart of the AUD/NZD. Since the pair is moving down, this means that the AUD is weaker than the NZD. 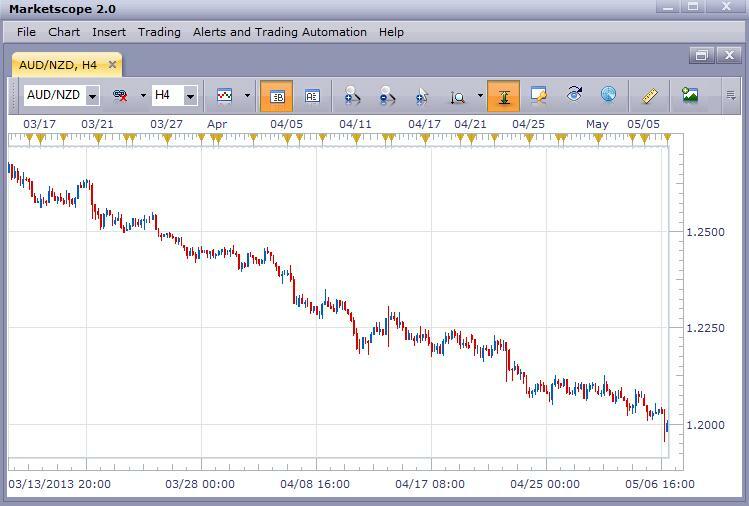 When using a 4-hour chart, using about 40 days of trading offers a good view to judge the trend. This is a 2-hour chart of the GBP/AUD. Since the pair is moving up, this means that the GBP is stronger than the AUD. 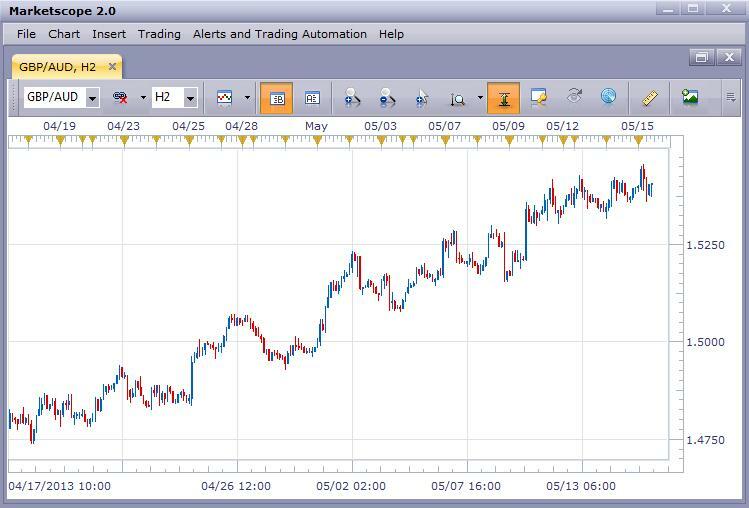 When using a 2-hour chart, using about 20 days of trading offers a good view to judge the trend. When identifying the trend, it does help to compare one chart with another. The goal is to find the strongest trending markets and to follow those until the trend weakens or you find a stronger trend. The best time frames for this are the daily, 8-hour, 6-hour, 4-hour, 3-hour, 2-hour and the hourly charts. Anything lower than the hourly and trading becomes more difficult because of the excess volatility the short time frame charts typically show.